At the moment I can't use my witch room for witchcraft. There are papers all over the floor and it wasn't me who put them there - my husband did that while I was on holiday. I'm not actually complaining about it though. At least, not yet. My hubby asked me if, while I was away, he could go through my late dad's collection of newspaper cuttings and reports about UFOs from the 1960s and 70s. My dad, who wrote about the paranormal and unexplained under the name Valerian Starza, was absolutely fascinated by flying saucers. He believed he had seen one during the war when he was fighting in Italy under General Anders. That started his big interest in unexplained phenomena. 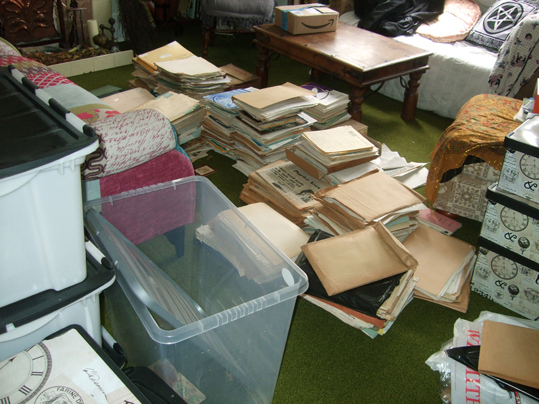 My hubby has long wanted to sort out my dad's UFO papers - which he has been called the Starza Files - and either write a blog or a book using the information. I'm glad he is now getting on with that, although I do hope the papers are off my witch room floor before I next have friends around for some tea and magic. Brings back memories of my childhood, and some strange visitors who came to your house and claimed they were from another planet. I recall they wanted my mother to feel the lumps on their heads, which they said were their antennas! Oh wow, I would love to read that blog or book! I am not surprised your Dad saw one during the war, there were a lot of things happening then that are still not explained. Thanks for the comments. I really want to encourage my husband to do something with those papers.